SpaceX has modified the historic Launch Complex 39A at NASA’s Kennedy Space Center for Falcon 9 and Falcon Heavy launches. The company is scheduled to launch from the pad for the first time on Jan. 30, 2017. CAPE CANAVERAL, Fla. — SpaceX plans to break in its new launchpad at NASA's Kennedy Space Center (KSC) just after midnight on Jan. 30 with a Falcon 9 rocket ride for EchoStar Corp. The launch will be SpaceX's first from NASA's historic Launch Complex 39, previously used by Saturn V moon rockets and the space shuttles. In 2014, SpaceX signed a 20-year lease with NASA to use the pad for Falcon 9 and planned Falcon Heavy rockets. The company has not said how much it has spent on refurbishments. 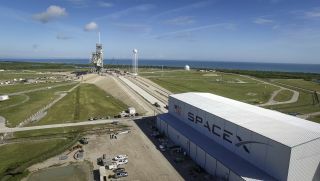 Getting launchpad 39A ready for use took on fresh urgency after a Falcon 9 rocket went up in flames on what had been the company's primary launchpad at Cape Canaveral Air Force Station, located just south of KSC here on Florida's Space Coast. The Sept. 1 accident destroyed the rocket and a $200 million Israeli communications satellite and heavily damaged the launchpad. SpaceX has not disclosed repair costs. The accident also grounded the Falcon 9 fleet while investigators pieced together why the rocket exploded as it was being fueled for a routine, prelaunch engine test. The company successfully returned to flight on Jan. 14, when a Falcon 9 blasted off from Vandenberg Air Force Base in California with 10 satellites for Iridium Communications Inc. During that mission, the rocket's first stage also came back down for a successful landing on a robotic "drone ship" stationed in the Pacific Ocean. The Federal Aviation Administration, which oversees U.S. commercial launches, has not yet issued a license for the EchoStar flight and a possible landing of the Falcon 9’s first stage.